Code Creator's LAMP Stack offers the latest version of Ubuntu LTS Trusty (16.04 ) as well as Apache 2.4.18, MySQL 5.7.17 and PHP 7.0.13. It comes with an admin launch page giving users tools they need through a web browser without having to log into the instance via SSH. Code Creator's LAMP Stack (CCLAMP) offers the latest version of Ubuntu LTS Trusty (16.04 ) as well as Apache 2.4.18, MySQL 5.7.17 and PHP 7.0.13. It comes with an admin launch page that shows instance meta-data information as well as links to Webmin and phpMyAdmin, giving users all the tools they need through a web browser without having to log into the instance via SSH. Webmin is a web-based interface for system administration for Linux. Using a web browser, you can setup user accounts, Apache, DNS, file sharing and much more. Webmin removes the need to manually edit Unix configuration files like /etc/passwd, and lets you manage a system from the console or remotely. phpMyAdmin is a web based MySQL administration interface. It supports a wide range of operations on MySQL and MariaDB. Frequently used operations (managing databases, tables, columns, relations, indexes, users, permissions, etc) can be performed via the user interface, while you still have the ability to directly execute any SQL statement. 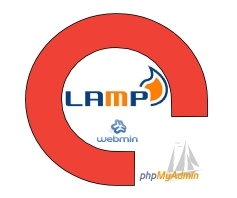 The LAMP Stack is considered by many the platform of choice for the development and deployment of high performance web applications which require a solid and reliable foundation.